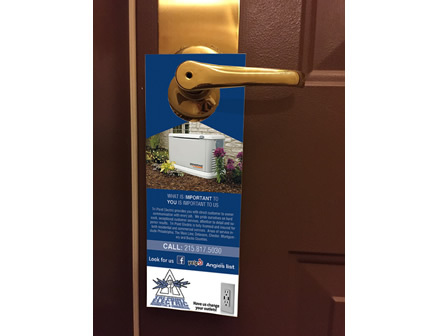 Door hangers are a great way to spread a message or promote a service around local community in a non-invasive way. They cost effective, they are set apart from any junk mail and are next to impossible to ignore as they achieve a high response rate. "Brian is a special businessman. He cares. He cares about your business and your order. The products Brian and Mirror Image have produced for me have been A+. I always get tons of compliments on my professional business materials. Thanks Brian for being the best at what you do and who you are. " Custom design is an additional $95. Door Hangers are printed full color on both sides on 12 pt. Gloss Cardstock (10% PCW recycled content, FSC certified, acid-free). They are ready to hang as soon as you get them. Rounded corners are available upon request. Like the idea but don’t know how you can distribute them? If you are in the local tri-state area of Philadelphia, Southern NJ or Northern DE, we can hire Donnelly Distribution to deliver the printed material at a fraction of its cost.